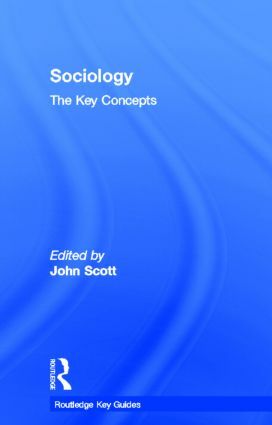 An essential A-Z guide to the full range of sociological thought, Sociology: The Key Concepts is an important addition to the established and successful Key Concepts series. entries on ‘traditionalism’ ‘race and racialization’ and ‘modernity’. Bringing together an international range of highly regarded contributors from the full spectrum of disciplines, this useful reference guide is the ideal resource for those studying or interested in this popular area. Contributors. Guide to the Book. The Key Concepts. Glossary of Theoretical Approaches. John Scott is Professor of Sociology at the University of Essex. His most recent books include Power (2001), Social Theory: Central Issues in Sociology (2006) and, with James Fulcher, Sociology, third edition (2006).